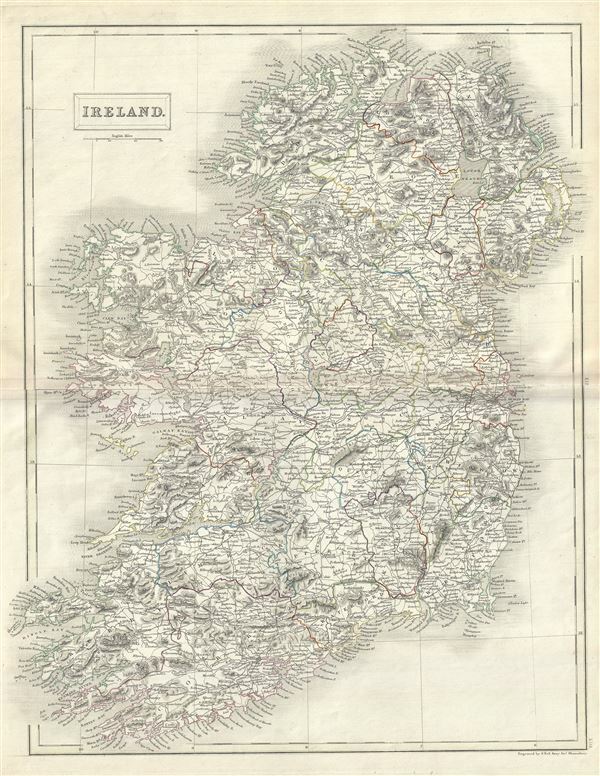 This is a fine example of Adam and Charles Black's 1844 map of Ireland. It covers from Donegal in the north to Cork in the south. The map shows all of Ireland divided by county. After the Norman Invasion the old provincial structure was supplemented with modern system of counties – even so the old provinces are still referenced today. Various important cities, rivers, islands, mountain ranges, and several other topographical details are noted with relief shown by hachure. In 1801, the island of Ireland became part of the United Kingdom of Great Britain and Ireland. Though Britain was flourished during this period, Ireland would witness the Great Irish Famine from 1845-1849 causing mass starvation and emigration and killing about a million people. As a result Ireland would experience a widespread exodus – mostly to the United States. By the end of the 19th century, almost 50% of immigrants into the United States would be from Ireland. This map was engraved by S. Hall for issue as plate nos. XII and XIII in the 1844 edition of Black's General Atlas. Rumsey 2305.021 (1854 edition). Philips (atlases) 4334.